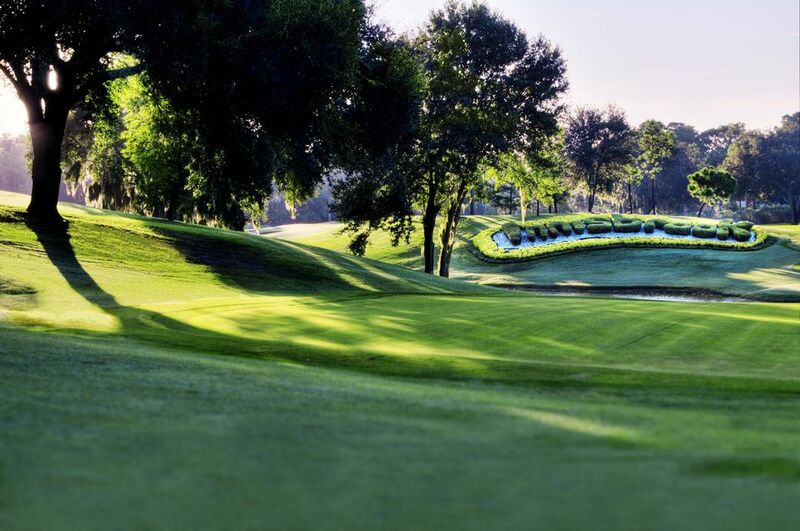 You’ll find the Innisbrook Resort, a Salamander Golf & Spa Resort; Tampa, FL nestled on 900 wooded acres of rolling hills in the St. Petersburg/Clearwater area. The Innisbrook Resort is world-renowned for its championship golf, and rightly so, because there are few grand resorts that can boast four – that’s right, four – championship layouts, 72 holes that will provide you with the golf vacation of a lifetime, and you’ll never need to leave the property; Amazing: the North Course, the South Course, the Island Course, and finally, the famous Copperhead Course, home to the PGA TOUR’s annual Valspar Championship. The four Innisbrook Golf Resort layouts were all designed by the innovative and imaginative Lawrence “Larry” Packard. A favorite among PGA TOUR professionals, the Copperhead Course recently underwent a six-month restorative enhancement. This 7,340-yard course is a lengthy challenge for even the longest hitters. The Island Course features six holes bordered by beautiful Lake Innisbrook and lateral water hazards that require pinpoint accuracy on tee shots and approaches. Similar in terrain to the Copperhead Course, but with a personality all its own, the North Course is known for its daunting par 3s, well-bunkered greens and recent course enhancements including additional yardage to selected par 4s and 5s. The par 71 South Course is one of those so-called links-style designs and does indeed have more than its fair share of rolling hills and breezes sweeping in from the Gulf of Mexico, just minutes away from Innisbrook Golf Resort, thus it has become a favorite among the resorts golfing guests. Apart from the impressive greens, the property boasts “six monstrous pools, multiple bars and restaurants, the 18,000 sq. ft. Salamander Spa and shuttle access to Honeymoon Island Beach, one of the Gulf Coast’s most romantic shores. For more information, visit the Innisbrook Website. Spend the day golfing, tasting some German favorites and learning about the great cause, “Beat Nb” at Innisbrook’s 1st Annual Golftoberfest. The tournament is an 18 hole shotgun format on the North and South Course. Food prepared by new Innisbroook Executive Chef Thomas. After the golf tournament, the Osprey Bar will be open for drinks and live entertainment. “”Beat Nb” seeks to raise funds and awareness for neroblastoma cancer research making a difference in kids’ survival today. The organization wants to change the story for the next family by finding viable treatments and ultimately a cure for neuroblastoma. A portion of the Golftoberfest proceeds with benefit “Best Nb.” $150 per person or $600 per team of four. All registration forms and payment must be received by Oct.1, 2016. Contact Kendra Law at 727-942-5283 or email Kendra at Kendra.law@playinnisbrook.com. visit the Innisbrook Website for more information. Great value, this one: Innisbrook is offering free golf, every day, all summer! Guests can pay to stay one night and get one free round of golf on any of the four championship courses, including the famed Copperhead Course. Starting at $109 per night and valid through Oct. 5, 2016. Can’t beaat this one: Innisbrook is bringing back their Classic Golf Package starting at $189 per night. Play a free round of golf per night of stay, enjoy golf-specific amenities and even get a free same day replay round during your vacation. Offer becomes valid Oct. 6 and runs through Dec. 31, 2016. Preferred? You betcha: This one is the most popular of Innisbrook’s Florida golf offerings, the Preferred Package includes one round of golf per guest per day, including arrival day and golf-specific amenities for a true golfer’s vacation. Starting at $185 per night, this offer is valid through Dec. 31, 2016. Operated by Salamander Hotels & Resorts and owned by Sheila C. Johnson, Innisbrook is one of Florida’s finest golf resorts. The layout is situated on 900 wooded acres of rolling hills in the St. Petersburg/Clearwater area on Florida’s Gulf Coast, and located only 30 minutes from Tampa International Airport. The resort features and amenities include 72 holes of championship golf, 550 spacious guest suites and rooms, four restaurants and three bars, the Innisbrook Golf Academy, 11 tennis courts, a luxury spa with 12 treatment rooms and state-of-the-art Fitness Center, six heated swimming pool complexes, a nature preserve, and three conference halls with 100,000 square feet of indoor and outdoor meeting space. Part of Salamander’s Golf Collection, Innisbrook hosts the annual Valspar Championship presented by BB&T at its famed Copperhead Course. For additional information, call 727-942-2000 or visit the Innisbrook Website.